The boys are setting up the wide screen. A dodgy connector is slowing us down. So I take my lime and cold water up onto the roof and step around the water containers and sat dishes and make my way to the edge. The sun has just gone down and a heavy haze of dust and fumes hangs on the horizon, speckled orange by the faded sun. It is just a little over 48 degrees and nothing moves. There is no sound, for we are deep in the burbs and there is no traffic that I can discern. The flip flop scuff of someones sandals alerts me to someone heading to the mosque. Its the only movement and sound. No birds. No dogs barking. Its too hot for any of that. As the night comes on and the sky softens the lads come upstairs and join me. Our glasses rain a small shower over our hands and onto the roof. We are stupefied by the heat and dominated by the silence. And captivated by the serenity of it all. Then the pizza arrives on a clattering push bike which dispels the magic and I am told the big screen is up and running after all. So we carefully make our way down the ladder and settle in to watch something so memorable I can’t recall it the next day!! The community mosques, as distinct from the large buildings in the middle of the cities, are just that, focused on their communities. They are places of worship but are open centres of community life as well. OK, at least for the men. I remember talking with some men exiting a mosque in the markets of Dubai. They had been there for prayers but had stayed on to drink coffee and to chat, and to take some business lessons. Business lessons?! Someone in the congregation was touting his business acumen for free and attempting to help the less fortunate with whom he rubbed shoulders. There are some wonderful mosques in Qatar but as with other places in the Middle East it seems that the smaller ones are the more interesting ones. The ones with most community interaction. That located in the middle of Doha had all sorts of activities happening in the evening, helped I suspect by being located just across the road from the markets. But by the time I walked past it on the last night of my visit it was quiet and the doors closed. Like most mosques they take on another air at night and many are lit to show off their lines and colour. 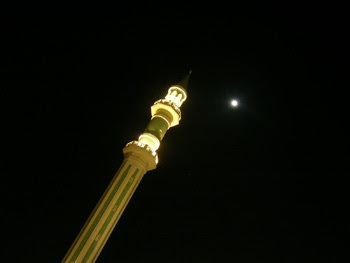 With a full moon out, the mosque and its towers were nicely showcased. In the heat of the night I stopped for quite a while and watched the moon shift its way around the towers. To go back to the hotel room seemed sacrilegious and I was in no hurry to go back there. Qatar is another one of those booming places in the Middle East that are a strange mix of old, ancient, modern, Arab and American. All popping up out of the desert. I walked this evening from the hotel, parked on the waters edge, out through the dark to a shopping mall. It was like walking through a new housing estate, with new roads laid out and services installed, street lights installed, palms planted and gently clicking in the slight breeze, but with houses yet to be built. In the middle distance I could see a large, unlit, multistory block house that I was told was the shopping centre. I wandered across a vacant lot, sinking into talc like dust and sand, plopping along creating my own mini sandstorm. The sun had sunk into a saffron sky a few hours earlier but the stifling heat meant I was carefully pacing myself. Stepping inside the mall was like stepping into another world – from the velvet quiet of the night to the blurring speed of a hectic mall, with thousands shopping or making the most of the airconditioning. But I did not come here to get lost in Western style malls. 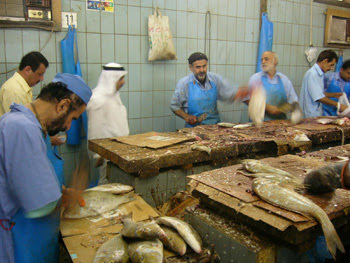 I had the good fortune today to be taken, during our lunch break, out to the fish markets. These are well and truly away from the regular tourist beat and they even took our local contact a while to unearth. That they were so far from the water was not a good sign. But here was local colour and smell, characters who eyed us warily and others who hammed it up for us. Naturally they were disappointed we were not buying. But in this heat, with no, or very little ice, you had to be quick to get in front of the locals who were snapping them up as quickly as they were cleaned and whisking them away. I hope they were taking them away to be chilled. Cleaned by an expert if not surly looking team of cleaners who gutted and scaled in a blur of movement that was a little disconcerting.